Even when it came and afterwards, it hits me like a surprise wind. held by something I couldn’t see. A waiting, something slow like that. a breeze when a car is moving. Watching children run in a soccer game. to cool it and I am suddenly alone with what I’ve taken, what I can’t leave behind. That miracle of 2 am when the roads have no memory. And no one awake at this hour to sweep it away. 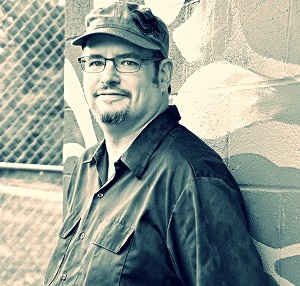 Robert Walicki is the curator of VERSIFY, a monthly reading series in Pittsburgh, PA. His work has appeared in HEArt, Stone Highway Review, Grasslimb, and on the radio show Prosody. He won 1st runner up in the 2013 Finishing Line Open Chapbook Competition and was awarded finalist in the 2013 Concrete Wolf Chapbook Competition. He currently has two chapbooks published: A Room Full of Trees (Red Bird Chapbooks, 2014) and The Almost Sound of Snow Falling (Night Ballet Press, 2015). Robert Walicki and I first met several years ago in a now-defunct Facebook poetry workshop group. 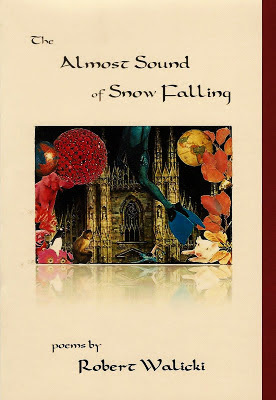 I wrote a blurb for the cover of his chapbook The Almost Sound of Snow Falling. It was a delight interview him about the chapbook and poetry. Please tell us a little bit about your chapbook. RW: The Almost Sound of Snow Falling follows my last collection, A Room Full of Trees, in a fairly chronological way, moving from the inevitable acceptance of loss as a state of existence, but then moving past that aftermath to explore identity and self. I think more so than anything, it's about growth, a trial by fire so to speak and the transformation that occurs as a result of these experiences. Some of the poems in The Almost Sound of Snow Falling touch on issues of masculinity and gender identification. Could you speak a little to this aspect of the book? RW: I had been interested in challenging stereotypical roles of masculinity after working for years in the construction trades industries. Society in general, can be very judgmental to individuals that don't fit into the expected or preconceived gender roles.When one is ostracized for their personality and make up, or even what they look like, it can be a very painful experience. This applies to many people and in many different fields and walks of life. The makeup of identity was something important to me and something that I wanted to understand to a deeper degree. Combing through hurt feelings and taking a candid look at what it means to be a man, and that being sensitive and caring didn't make you less masculine, was something that appealed to me a great deal. [M]emory is unstable and idiosyncratic, and follows a structure and procedure much like narrative … [E]motion is the basis of long-term memory, and our reactions to the world around us are a complicated concatenation of the narratives we’ve written and continue to write in our brains in conjunction with reactions to new stimuli, which is often interpreted according to old patterns. Everything we 'know' is a narrative construction based on sometimes idiosyncratic interpretation. What is the role of personal memory in your poems? When you’re writing your poetry, do you find memory to be something more solid, like Roberts examined the first quote—an inseparability between self-identity and the past? Or is it more permeable, as discussed by Heywood? RW: I think for me, it's a combination. It really depends on the poem and the voice that leads me. I'm very much a believer of letting the poem determine what it's going to be, so in that sense, I feel memory is a very fluid thing. For example, there are poems like "First Snow" or "Ostaria" that attempt to capture the uncapturable or indescribable. Memory, when layered with emotion, often gets very complicated. There can be a lot to unpack and equally, so much of what I remember is colored by emotion and shaped by it. Truth, or what really happened, changes when I write, because what is more important to me, is whether a poem is "emotionally true" and not necessarily 100 percent factual. I'm fascinated most of all by concrete imagery as a doorway into memory and emotion. It's almost involuntary for me, like Proust. It's a very serendipitous thing. A shirt ripping on a nail reminding me of the loose buttons on a mother's coat in a photograph and suddenly, I'm writing the poem "In The Years Before Color," and everything a simple black and white photograph evokes from the past, and the future. Why did you choose the chapbook as the vehicle for your poems rather than a book-length manuscript or a section in a book? When you started, did you intend to create a chapbook? How long did it take to write this chapbook (or, alternatively, how did you know it was time to stop writing)? RW: In general, I find it easier to focus on a chapbook length collection. I'm very attracted to shorter length formats in terms of a sharper, thematic focus, although I'm currently working on a full-length. I don't think I ever sit down consciously and say "I'm ready to write a chapbook." It happens organically and I think the best ideas come from that aesthetic. I never stopped writing after my first chapbook came out and in a very fertile period for me, I suddenly had a lot of poems that I felt were speaking to each other. My style was, and still is, evolving, especially from A Room Full of Trees, my first chapbook. I felt I was loosening up, was more frank in my language and was moving on from many of the things that I was obsessed about in the first book, namely my father's death and how that changed me as a person. However, one could make the argument that a few of the early poems in this collection could fit right in thematically with that first book. RW: That's difficult,but for me, the most crucial poems in this book are the work poems, because they were the hardest to write and the most important. As I've said before, I feel this book is about growth and I think these poems illustrate that process in a profound way for me. Those experiences changed me and forged me into the person I am, worlds away from the person I was before these events happened. It took years to write this one in particular (it's not quite a year old), mostly because it was extremely difficult for me to find the poetry or "music" in these hard experiences. I also needed some emotional distance from what happened and perspective so I could write with the clarity and the restraint necessary to do justice to the material. I finally came to the conclusion that a simple frank and matter of fact tone was the best approach in writing about this kind of work. This poem is called "Rain Leader." or better yet, keep moving. Marlboro smoke in your face. First day, it's "Hey rookie" and "Don't look down"
It's lift this 8 inch, cast iron pipe. there's no such thing 4 stories down. grizzled beards twisted like dry rotted wire. Last night's whiskey, sweating from dirty skin. on the pipe, straps loosening, metal slamming flesh. Like the father who couldn't bear it. your waist, a broken man who leads you. he'll walk like a free man across 4 inches of steel. You curate a monthly reading series for poets. How do you feel about spoken-word or performance poetry versus poetry on the page? RW: I have learned from personal experience that when preparing to do a reading, I choose work based on readability and my audience. Knowing one's audience as well as having a balanced set list of poems is a real key to a successful reading. There are beautiful poems that I've never read for example, because I feel that they are either too "quiet" or "contemplative" or better on the page than ones that either have more movement in them, or are more accessible to a wider audience. Regarding performing, I've had a few poets who qualify as performance poets in my series and I am always in awe of the energy that's brought to a poem by a gifted performance poet. It's a different aesthetic than more traditional poetry,but I often think that traditional poets could learn from performance poets in terms of being better presenters of their work, and performance poets could learn from the traditional poets as well. However, everyone has a unique gift to share with the world, and my goal is to celebrate that, give them a platform. What difficulties or challenges did you encounter in writing some of the poems? in publishing the collection? RW: There's always a fear that certain poems can be misinterpreted or something may offend someone, but I made a decision while writing my first book: Do I want to be a truth teller, or I do I want to play it safe and write pretty, lyrical poems for the whole family? Being a "tell all" kind of poet can be very difficult and a sometimes painful road to go down. It's something I continue to struggle with, although I've made peace with who I am as a poet. Have you given a public reading of the work? What was the audience response? Did you encounter anything you were not expecting? RW: I recently gave my first reading from the chapbook in Cleveland for my press, Night Ballet, at the wonderful Max Backs Books. I love to do readings in general, but this was a special night and the crowd was warm, attentive and engaging. I'm looking forward to going back! RW: I have several projects that I'm working on currently, a full length manuscript, as well as another chapbook which is going to be a big departure. All of the poems will have or be inspired by pop culture references, so that's going to be a fun project when it's finished.